Libero Copper is acquiring high-quality copper deposits in the Americas with significant resources but without any fatal flaws or significant holding costs. These assets are being advanced and de-risked by a seasoned team to minimize dilution and maximize shareholder value. 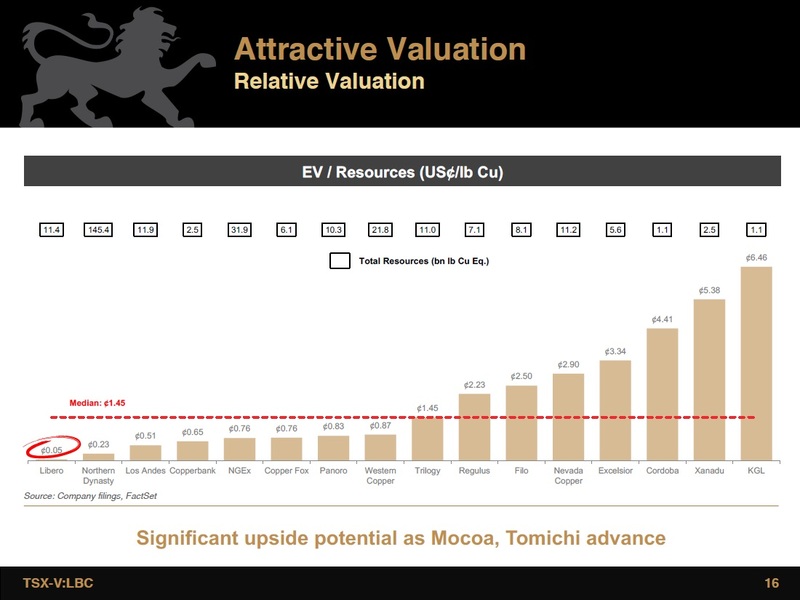 The portfolio currently includes the Mocoa deposit in Colombia which contains an inferred resource of 636 million tonnes at a grade of 0.45% copper equivalent and the Tomichi deposit in the United States which contains an inferred mineral resource of 711 million tonnes at a grade of 0.33% copper equivalent. In total the properties contain 7.9 billion pounds of copper and 1.1 billion pounds of molybdenum. 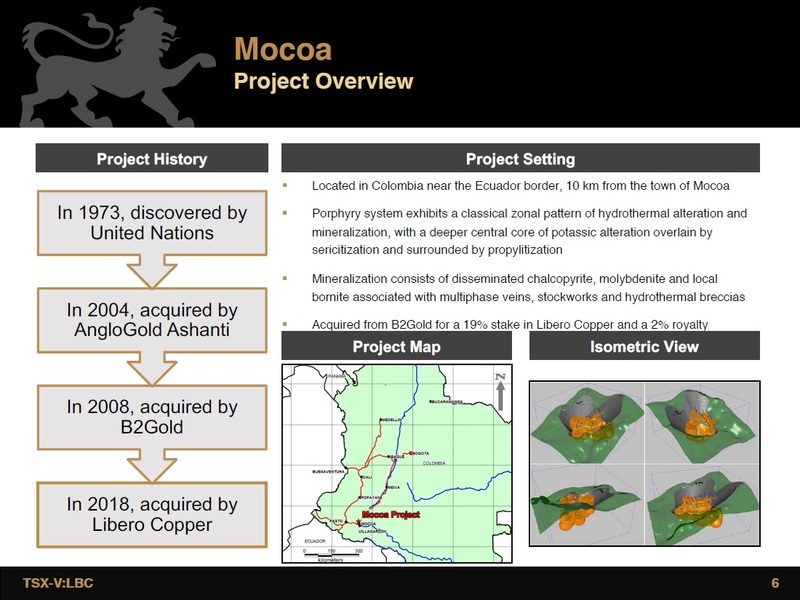 The Mocoa deposit contains an Inferred mineral resource estimated at 636 million tonnes at a grade of 0.33% copper and 0.03% molybdenum, 4.6Mlbs copper and 511Mlbs molybdenum, at a cut-off grade of 0.25% copper equivalent. 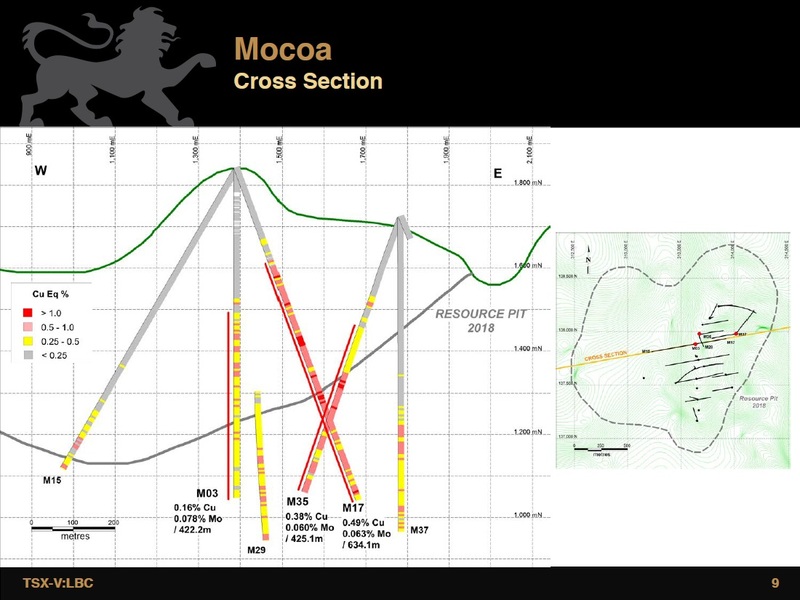 The Mocoa deposit forms a continuous zone of copper and molybdenum mineralization over an area measuring approximately 1.2 km east-west by 1.4 km north-south and extending to depths of more than 1 km below surface. 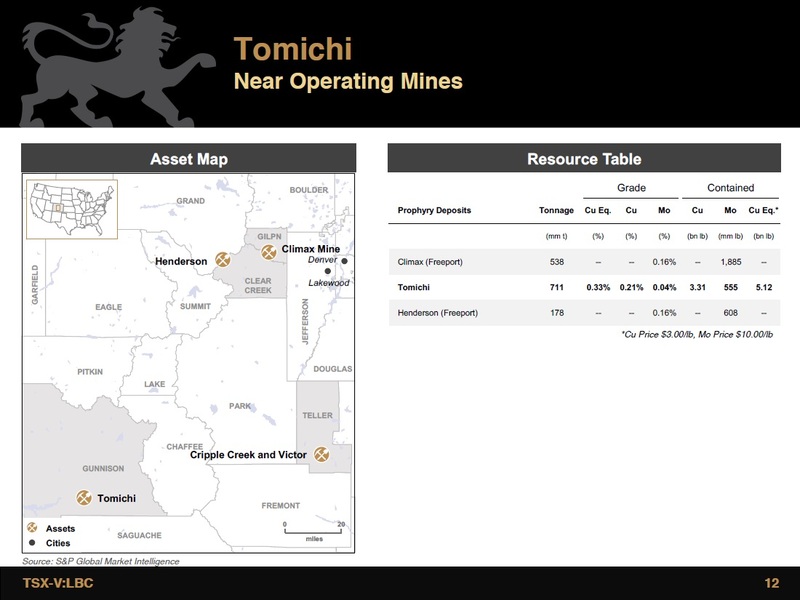 The Tomichi deposit contains an Inferred mineral resource estimated at 711 million tonnes at a grade of 0.21% copper, 0.035% molybdenum, 0.017 g/t gold, 2.0 g/t silver and 0.22 g/t rhenium containing 3.3Blbs copper, 555Mlbs molybdenum, 393koz gold, 46Moz silver and 339klbs of rhenium, at a cut-off grade of 0.25% copper equivalent. The mineralized area identified on the property is estimated at 550 m by 825 m by 600 m deep and remains open. 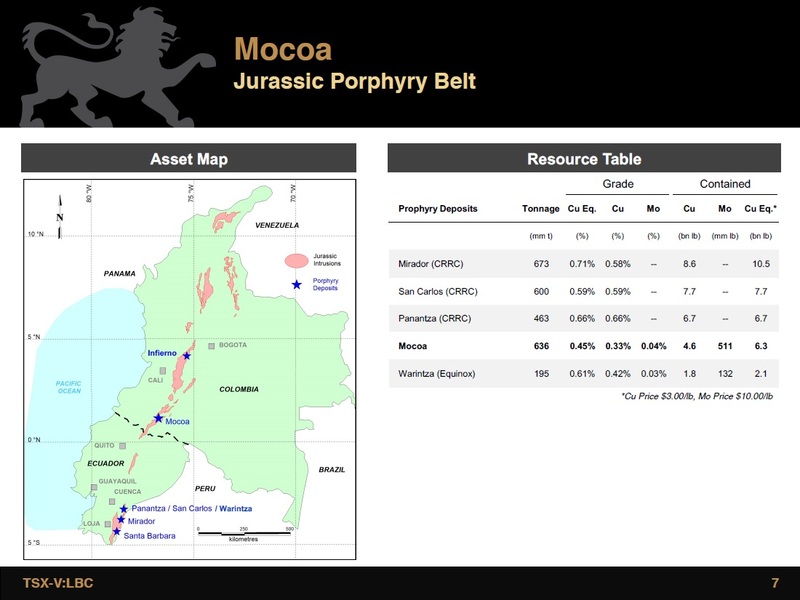 High grade Mocoa deposit located in Colombia with past exploration by AngloGold and B2Gold. Inferred mineral resource of 636 million tonnes at 0.45% CuEq. 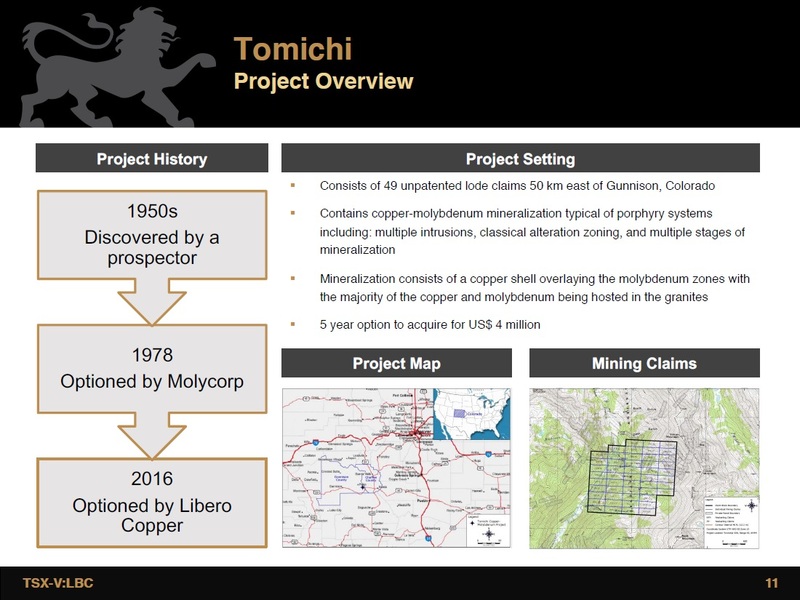 Highly prospective Tomichi deposit located in Colorado, U.S. with significant past drill campaigns. Inferred mineral resource of 711 million tonnes at 0.33% CuEq. On February 11, 2019, Libero Copper Corp. announced that it has closed the option agreement to acquire 100 per cent of the Big Red porphyry copper-gold property in the Golden Triangle in British Columbia, Canada, announced on Jan. 28, 2019. Libero Copper may acquire 100-per-cent of Big Red in return for the issuance of two million common shares of Libero Copper and cash payments of $440,000 over four years. The vendors have retained a 1-per-cent net smelter return royalty, 0.5 per cent of which may be repurchased by Libero Copper at any time for $10-million. On January 28, 2019, Libero Copper Corp. announced that it has entered into an option agreement to acquire 100 per cent of the Big Red porphyry copper-gold property in the Golden Triangle in British Columbia, Canada.